Acronis Managed Machine Service runs under the user with necessary privileges, e.g. Domain\Backup. (!) This article applies only to backups to some NAS devices. If you face the same issue when backing up to a network share, the issue is not covered in this article. For some NAS models, Acronis Backup & Recovery 10 cannot access NAS using the credentials under which Acronis Managed Machine Service runs. 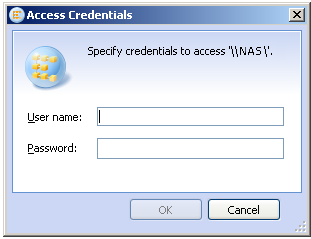 As a workaround, specify different credentials for accessing the NAS in the Access Credentials window. The user must have read/write access on the NAS. (!) This article applies only to backup to NAS. If you backup to a different destination, the issue is not covered in this article and needs investigation. Please contact Acronis Customer Central with a reference to this article. Acronis Backup & Recovery 10: Backup Plan Creation Errors Out with "Failed to update the backup plan"